Lord of the Streets (LOTS) is the special Mission Church of the Diocese of Texas for Houston's homeless and disadvantaged. Even as Jesus urged us to give cups of water to all who are thirsty, LOTS seeks to also provide living water for the soul. Established by Trinity Church, Houston, in 1990, LOTS is a growing and increasingly respected ministry in mid-town Houston. Please join us in this ministry to those who are thirsty, in mind or body or spirit. "Be a Saint for Lord of the Streets" is our annual fundraiser benefiting the Lord Of The Streets food program. 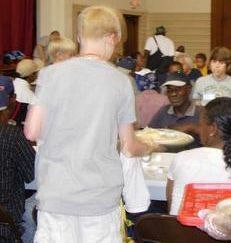 250+ community hot breakfasts are served weekly at Trinity Church Sunday mornings following the church service. Over 250 sack dinners are distributed a week and Thanksgiving dinners each year serve upwards of 450 people; meaning that over 21,000 meals were provided last year. This service is a vital part of Trinity’s presence to the Midtown community.